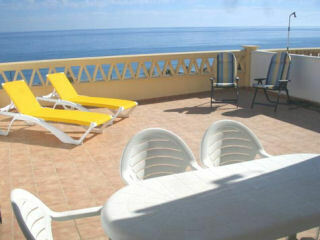 This is a brand new three bedroom, two bathroom villa offering spectacular sea views. 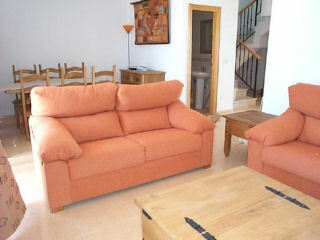 From a small porch enter into a spacious lounge and dining area with new furniture, air conditioning and satellite T.V. The smart dining table has 6 matching dining chairs. There are three large double French windows leading onto a huge terrace with sun loungers, patio table and chairs. From here there is an uninterrupted view of the communal pool and sea. The kitchen is newly fitted with light coloured units and all modern appliances including dishwasher and washing machine. There is also a microwave, electric kettle and toaster and electric oven and hob. The fully tiled downstairs cloakroom has a w.c. and wash hand basin. Go up a curved flight of marble stairs to three bedrooms and two bathrooms. Bedrooms one and two both have twin beds and a fitted wardrobe. One of them has a view to the sea from the window. The family bathroom has a bath with shower over, w.c., bidet and wash hand basin. Bedroom three has a double bed, two fitted wardrobes and air conditioning. There are double French windows leading to a patio which has full views to the sea and communal pool. The en suite bathroom has a bath with shower over, bidet, w.c. and wash hand basin. The whole of the accommodation is tastefully decorated throughout and is light and airy. Both of the bathrooms and the kitchen are beautifully tiled. All of the rooms are a good size and, being brand new, are in very good order. To the rear there are very pleasant gardens which are well kept. There is off road parking available.